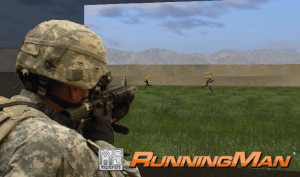 RunningMan’s® lead indicator shows a combatant where the shot location needs to be based on a dynamic calculation of the target speed, distance, wind and bullet speed. Immediate feedback in the form of a miss indicator is optional. Additional training tools such as a distance and speed meter above each target or distance reference markers may be toggled on/off in real time during training. RunningMan® enables a detailed shot analysis indicating where each shot hit the target. The RunningMan® courseware also includes a built-in after-action review (AAR). After each training session instructors can examine shots fired including shot placement, flight path, and target impact, all of which can be controlled with the DVR-style user interface. RunningMan® includes a variety of landscapes with obstacles that can be turned on or off in real-time. Each landscape has the option to display non-combatants intermixed with combatants to add the extra challenge of target discretion along with target engagement.